Scandinavian-style design and decor are dominated by soothing and neutral colours, clean and practical designs, and elegant simplicity. And the 70sqm home we are about to explore today is a perfect epitome of all that. Rendered by the architects at Ark Studio, this residence combines trendy furniture with hues like white, black, and grey for a serene and comfy look. Light wooden elements offer warmth, while stylish lighting and cosy textures make living here a wonderful experience. Ample exposure to natural light is also another reason why this home seems so inviting. 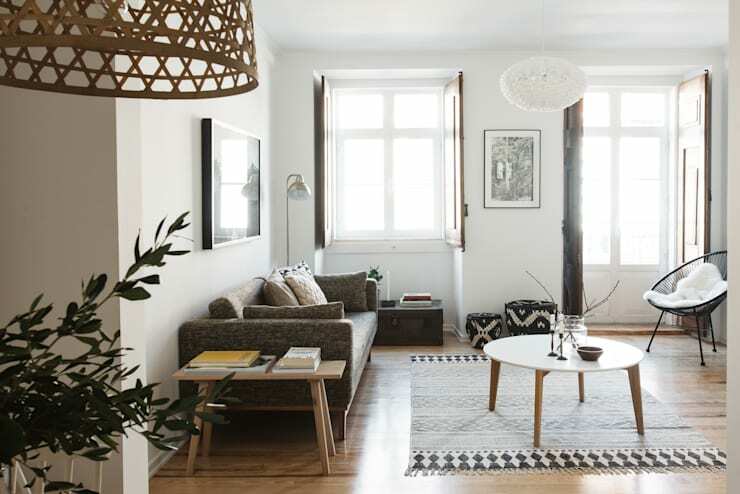 Large windows flood the living space with sunlight, while whites, greys and wooden tones fill it with character. Trendy furniture, a plush couch, monochrome paintings, and an artistic rug are the highlights here. 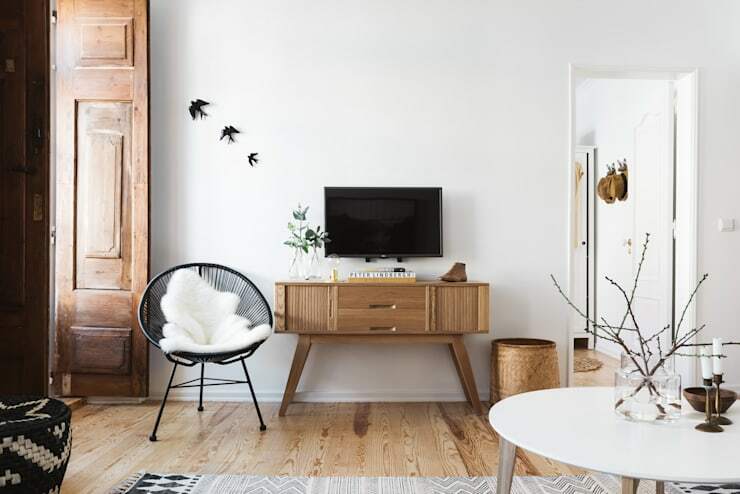 The wooden TV unit in the living space is a blend of tradition and modernism, with the sticker depicting birds livening up the wall. Wicker baskets, glass jars holding dry branches, and old-fashioned candlesticks add a subtly rustic appeal here. 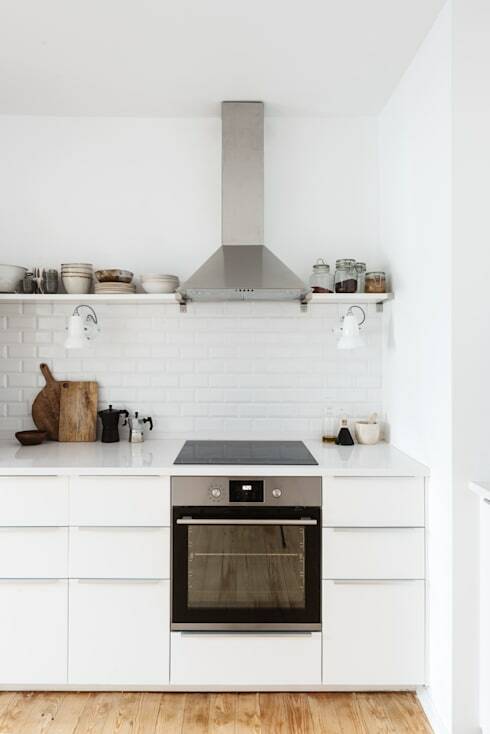 Bright white walls, glossy cabinets, modern appliances and neat railway tiles on the backsplash make this kitchen cheerful and charming. Slim overhead shelves help in organising all that you need to access regularly. 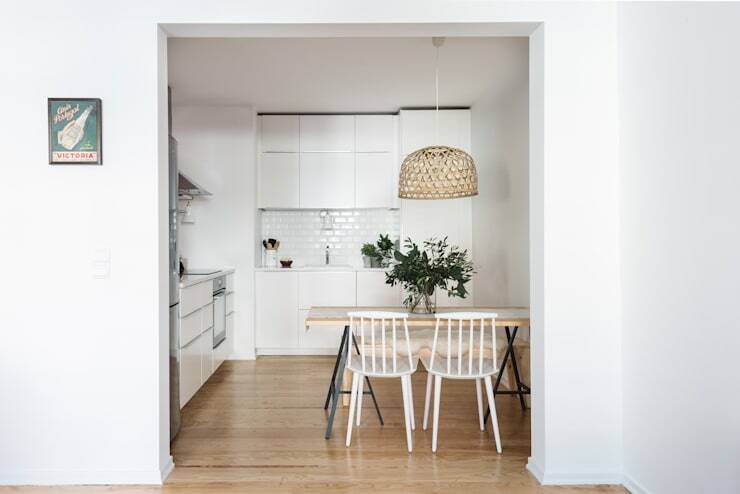 From here, you can see how the light-hued wooden flooring lends warmth and contrast to the white kitchen. The dining furniture is fashionable and sleek, while a large vase of greens and a cane lamp add personality. 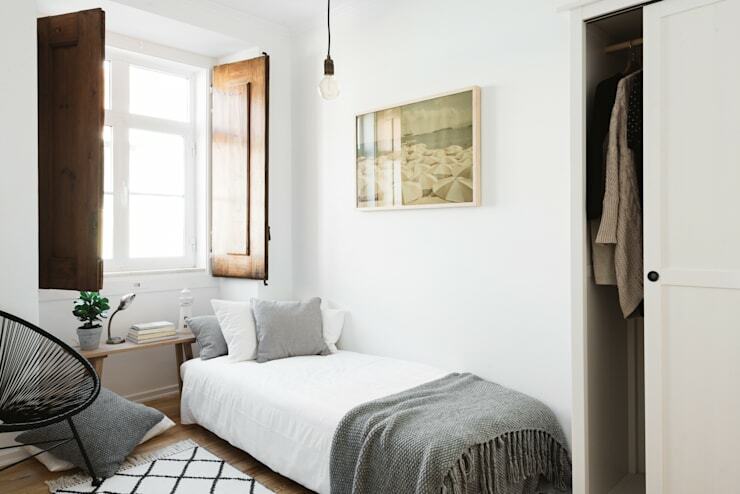 A plush single bed positioned cleverly near the sunny window make this small bedroom very comfortable and welcoming. Soft tones of white and grey lend a layered look here, while the dark wooden shutters contrast the environment beautifully. White is again the dominant hue in the spacious master bedroom, making it airy and bright. 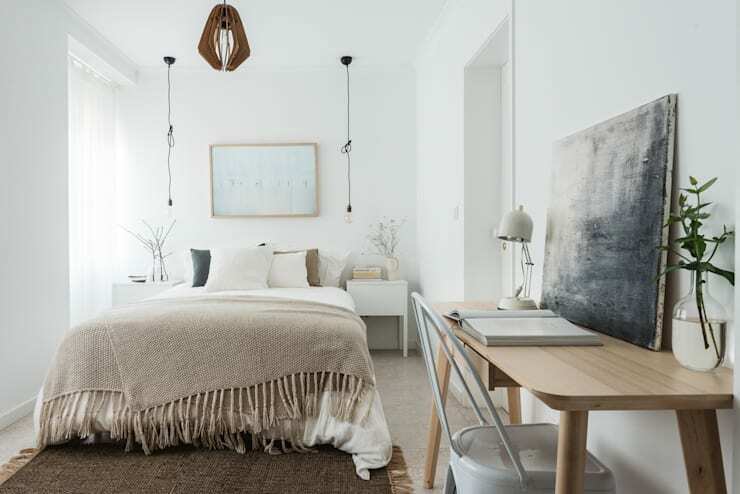 A large comfy bed with cosy cushions, industrial style reading lamps hanging from the ceiling, neat side tables and abstract paintings pull the look of this room together. The study station comprises of a chic wooden table and a trendy chair. 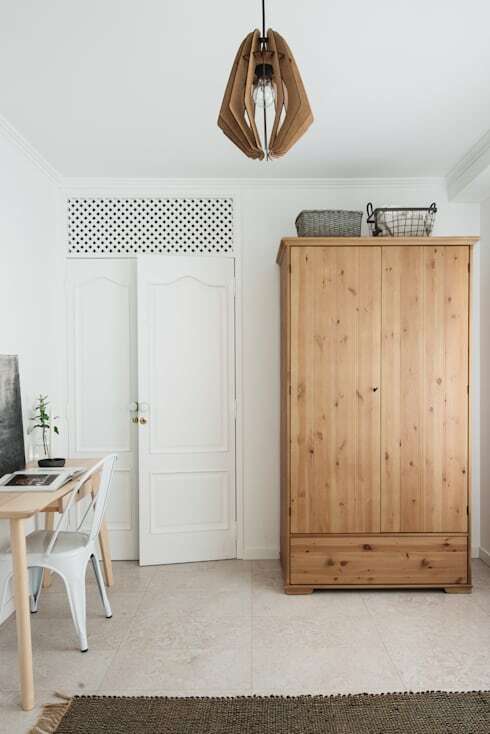 A view of the other side reveals a tall wooden closet which appears warm and very storage-friendly. Also note how the wall above the door has been smartly perforated to allow cross ventilation, and it lets some amount of light pass through. 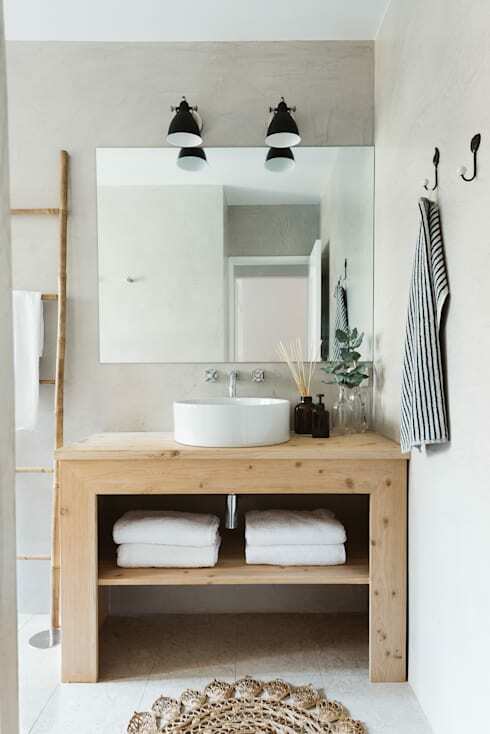 The large wooden sink unit lends this bathroom a dash of rusticity, while the sink and other fixtures ensure modern appeal. Hooks, bold black pendant lights, a large mirror and cosy white towels make the ambiance refreshing and bright. Don’t miss the slim ladder on the left; a clever idea for hanging used towels.